(AP) Overnight thunderstorms hampered the search Saturday for missing victims of the interstate bridge collapse, as Navy divers were held out of the water for several hours because of a dangerously fast current in the Mississippi River. The predawn storms brought as much as 2 inches of rain and wind gusts of 70 mph, delaying the divers' normal start time by about three hours. They were back in the water by 11 a.m., but coordinators had a wary eye on the skies, with more storms possible later in the day. "If they feel they're not safe anymore or conditions change, they'll stop again," said Randy Mitchell, an Army spokesman working with the Navy team. If conditions hold, he said divers would probably work until 8 to 10 p.m. The brief delay came after a two-day flurry of activity that saw Navy divers recover three of the eight people on a list of known missing. That brought the confirmed death toll from the Aug. 1 collapse to eight. Family and friends prepared for a double funeral on Saturday for a mother and daughter killed in the collapse. 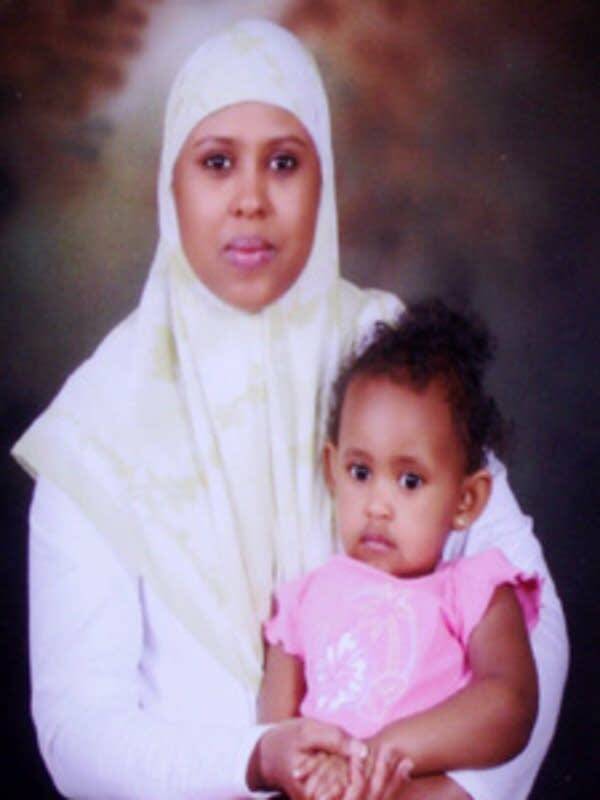 The bodies of Sadiya Sahal, 23, and her 22-month-old daughter Hana, of St. Paul, were among the three recovered Thursday and Friday. Sadiya Sahal, who was five months pregnant, had her daughter in the back seat of her car as they sat in the bumper-to-bumper traffic on the bridge. She had been on the way to pick up a friend who needed a ride to work. Sahal was a nursing student who emigrated to Minneapolis from Somalia in 2000, and graduated from the city's Washburn High School. She became a U.S. citizen last year. Omar Jamal, a leader of Minnesota's Somali community acting as spokesman for the Sahals, said Sahal's husband Mohamed was still devastated by the loss of his family but that he felt deep gratitude to divers and others for the search. "There is a huge relief to bring this into closure," Jamal said. Mother and daughter were buried at a Muslim cemetery in a Twin Cities suburb. Sadiya and Hana were buried side by side, after which there was another prayer. Ahmed Sahal, the father of Sadiya and grandfather of Hana, released a statement through Jamal that expressed relief for the closure that came from the burial after a long, difficult search for his relatives. "I do feel the pain and emotional suffering if there are still families missing their loved ones," Ahmed Sahal wrote. While some families of the missing were able to start moving on, others were still waiting for word on their loved ones. Lisa Jolstad's husband, Greg Jolstad, was a member of the construction crew working on the bridge when it collapsed. "My biggest fear is that he's going to be the last one, and they're going to give up before they find him," Jolstad said Saturday from her home in Mora, about 90 miles north of Minneapolis. "It's really hard when there's no news - I can't even think about anything else." Jolstad said she was spending the day with her husband's brothers and sisters, cleaning out the 1910 farmhouse where Greg Jolstad was raised and where he continued to live with Lisa and her kids, for whom Greg had been stepfather since 1995. "We're just trying to keep busy," she said. Saturday was the last day of operation for a victims' assistance center that had been staffed by Hennepin County and the Red Cross. It opened the night of the collapse at a hotel by the bridge and moved a few days later to nearby Augsburg College. Red Cross spokesman Ted Canova said the county and the Red Cross have each assigned a caseworker to the families of the dead and missing and that services like grief counseling and updates on the search would still be available. "The outreach will continue," he said. About 100 people were injured in the collapse, but fewer than 10 remained hospitalized, ranging from serious to good condition. The Minnesota Department of Transportation announced Saturday that its debris removal contractor had so far removed 16 vehicles from the north end of the bridge. The contractor has moved equipment into place to begin major debris removal once the recovery operations are complete. As MnDOT looks toward rebuilding, Lt. Gov. Carol Molnau, who is also transportation commissioner, recommended to Gov. Tim Pawlenty that a light rail line not be incorporated into the new bridge, which had been suggested by some. In a letter sent to Pawlenty and released Saturday, Molnau and Metropolitan Council Chairman Peter Bell wrote that the time needed to study the feasibility of light rail on the bridge would cause "unacceptable delays" in its construction. State officials are aiming to have the replacement bridge built within 18 months.